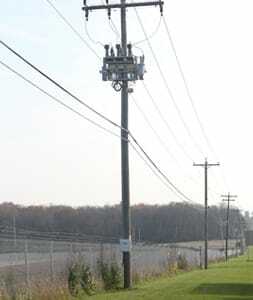 The Hubbell® standard capacitor banks offer a reliable and comprehensive pole-mount capacitor rack solution that meets the needs of electric cooperatives and public power utilities. 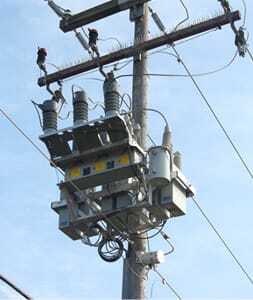 They are designed to simplify the ordering process by providing easy selections for customers, and covering most of the common requirements for a pole mount power factor correction solution. Our standard capacitor banks are factory assembled, pre-wired and are delivered ready for immediate field installation, including the wildlife protectors as a standard offering. The Hubbell Standard Capacitor Banks are designed for a grounded-wye system covering the most common distribution voltages of 12470V / 95kV BIL and 24940V /125kV BIL (operating voltages indicated are L-L). Download more information about our Standard Pole Mount Capacitor Banks. The Hubbell Standard Cap Bank offers options such as your choice of No Capacitor Switches (for a fixed bank), CSD oil switches, VS Series vacuum switches or UltraVac® solid dielectric vacuum switches. 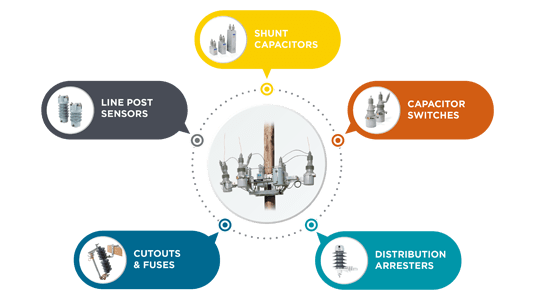 The Standard Cap Bank also offers selections for control power transformer, Hubbell line post current sensors, neutral current sensors, Ohio Brass® PDV100-Optima arresters, junction boxes, meter sockets and capacitor bank controllers. This “One Hubbell” PFC solution brings together high-quality Hubbell products in a standard, easy-to-order package that best suits the needs and demands of the public power and electric cooperative customers. Standardization in our design and components allows for a streamlined manufacturing process and shorter lead-times for delivery. You make simple selections based on your system parameters and we offer an economical, turnkey capacitor bank solution for your application!